A cold can hit at any time of the year and when it does I’m sure you’ll want to get rid of the symptoms as quickly as possible so that they don’t get in the way of your work and leisure plans. Cold remedies can speed up recovery but don’t forget that diet also has a part to play here too. 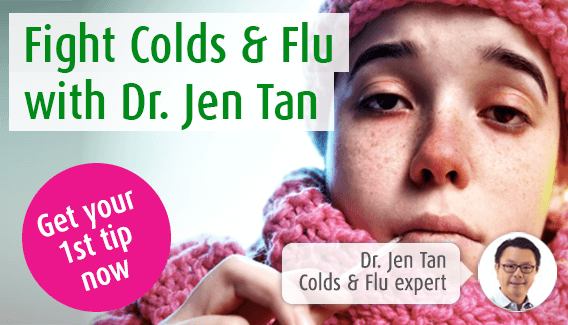 In this blog I look at why this is the case, plus I give you my top 10 foods to help beat that cold. What impact does diet have on cold symptoms? Feed a cold and starve a fever, or so the old saying goes. Some people may take this to mean that when you are gripped by a cold you can at least alleviate your misery by snacking to your heart’s content but I’m sorry to say this isn’t the case! As naturopath Alfred Vogel would have pointed out, when battling an infection the last thing your body wants is to be lumbered with heavy, hard to digest food so choosing the right things to eat is really important. Also, if you feed your cold with stodgy foods then the body will not have the nutrients it needs to tackle an infection so it may resort to burning it off instead. As a result, you may find yourself battling a fever on top of all those other frustrating cold symptoms. There are a number of foods that can boost the immune system and in doing so they help to prevent colds and flu. However, even if you do become the victim of an infection there are a number of foods that can both ease symptoms and speed up recovery. I realise that when you’re feeling poorly the last thing you feel like doing is eating however, staying well-nourished and hydrated helps your body fight off infection so it’s necessary to keep up a regular intake of food at this time. So, what exactly should you be eating? Soup is a tasty, warming dish that’s ideal on cold winter evenings however, did you know it could also be beneficial when you’re suffering from a cold or flu? The idea that chicken soup can cure colds may be seen by some to be an old wives’ tale but there is actually some truth behind this idea. That’s because chicken contains a substance known as carnosine which has anti-inflammatory effects. This means it can help to reduce symptoms such as a blocked nose and sore throat, particularly in the early stages of infection.1 That’s not all though, this delicious broth also helps to prevent dehydration whilst the steam may also reduce congestion further. Still, this is all well and good for those of us who are happy to eat meat but what about the vegans and vegetarians amongst us? Well, fortunately a hearty vegetable soup or stew could be just as beneficial as these are packed with the nutrients your body needs to fight off an infection. Also, the warm liquid will sooth a sore throat and ease a blocked nose in the same way that chicken soup does. I realise that when you’re not feeling well you don’t often feel like venturing out the house never mind getting into the kitchen to whip up bowl of soup. However, you’ll feel the benefits from a dish like this so why not keep some in your freezer in case of emergencies? Alternatively, ask those around you for a favour – can they cook up some soup to help you feel better? Our Easy Spicy Sweet Potato Soup is a great option as it takes just 15 minutes to cook and is made from 8 simple ingredients. So, even if your partner or friend is no Gordon Ramsey they should be able to manage this! Top tip: Garlic supports the immune system so add a few extra cloves to your recipe for an extra boost! If you aren’t a big fan of seeds however, oysters, poultry, beans, nuts, kale and wholegrains are also rich in zinc so there are plenty of ways to up your intake. Top tip: try our pumpkin spice breakfast bars for an immune-boosting snack! They may make your eyes water but spicy foods can actually help when you’re loaded with the cold. That’s because they temporarily open the sinuses thus enabling mucus to flow more easily and thereby easing congestion. Again, there is plenty of choice when it comes to eating spice - hot sauce, wasabi, peppers and chilli all give the effects I’ve just described. However, if you’re looking for a recipe suggestion you can, once again, turn to our food hub for inspiration. Our hearty Spicy Bean Hot Pot is packed with vegetables, spices and pulses, as well as a range of vitamins and minerals, so is just what you need when you’re feeling poorly. Top tip – spicy foods have a tendency to upset stomachs which isn’t good when you are already feeling the worse for wear so be careful not to over-do it with the hot sauce! Top tip: add some banana to a homemade smoothie to gain even more nutrients! Yet another important nutrient for the immune system is vitamin A which is found in abundance in spinach. This vitamin gives the immune system an added boost but also strengthens the mucous membranes to tackle the likes of a runny or blocked nose too. Top tip: sweet potatoes, carrots and squash also contain vitamin A so you could try mixing all three with spices and chopped tomatoes to make a vegetable curry. Vitamin C plays an important part in supporting the immune system but not only that, studies have shown that it can also help get rid of a cold quicker too. Most people automatically turn to oranges to get their vitamin C intake but don’t forget that peppers also contain a generous amount. These are extremely versatile and can be incorporated into salads, salsas, pasta dishes and much, much more. As I’m sure you are aware, citrus fruits such as oranges, lemons, grapefruits and limes hold a large vitamin C content. The soft white layer of skin found on these fruits contains flavonoids which can help boost the immune system but, as I’ve just mentioned, they also speed up recovery too. Top tip: For an extra boost of vitamin C you could try Nature-C, a vitamin C supplement made from natural sources which are easier for the body to absorb. These delicious little berries are packed with antioxidants which are well-known for their anti-aging effects. However, antioxidants also help to protect the body from infection and disease making blueberries the perfect antidote to cold and flu symptoms. Top tip: Mix a few of the fruits I’ve discussed with a little fruit juice to make the ultimate cold-busting snack! The live, friendly bacteria in yogurt can aid your immune system to give you that added edge when fighting a cold. Also, the majority of your immune cells live in your gut so keeping them happy with friendly bacteria is a good idea. Top tip – opt for natural yogurt which has less sugar and added ingredients than other varieties of yogurt. Top tip: if you don’t eat fish you could try an omega 3 supplement to up your intake – our friends at Jan de Vries stock a few brands including Lamberts Omega 3 Capsules which are made from natural, high quality fish oil. 1 “Management of the virulent influenza virus infection by oral formulation of nonhydrolized carnosine and isopeptide of carnosine attenuating proinflammatory cytokine-induced nitric oxide production.” Am J Ther. (2012).